Why is Personal Capital Free? The Catch! I’m sure you’ve seen a number of these already, but here’s my Personal Capital Review. If you’re interested, you can sign up for Personal Capital here. Let’s start with the bad. Personal Capital is free because they want to actively manage your money (don’t let them!). When I signed up for Personal Capital over a year ago, the sidebar showed me a picture of a banker under the caption “Your Advisor.” Since then, they’ve heated up the hard-sell a bit more. I now get emails that say things like: “You’re not on track for retirement! Call your advisor today!” When I log in, I often have to click out of a pop-up showing me my advisor and asking me to give him a call. This is all annoying. And things may get worse (who knows?). Personal Capital makes no money off of you unless you contact your advisor and have them manage your funds. DON’T! Years ago, I used a service called Manilla. It put all of my accounts (credit cards, bank accounts, investment accounts) into one login. I could check my balances with one log-in. I could check if my bills were due. I LOVED it. Seriously life-changing. Unfortunately, Manilla went under at the same time Lui was born. In the transition of having to log into all of my accounts separately (and having a baby! ), I missed a credit card bill and ended up paying a late fee and interest for the first (and hopefully only) time in my life! Personal Capital has replaced this service for me. I can log in, check all my balances, see if bills are due, and even see a list of the charges for each credit card. All in one login! (my lazy self loves this. seriously.) With our conservative travel hacking, it’s nice to be able to see all of our open credit card accounts in one place. Net Worth Updates in 5 Minutes! I used to have to log in to each account and add them all together in my net worth spread sheet for each month’s plan updates. Now, I can update my spreadsheet in less than five minutes. It’s BRILLIANT. Recently, Personal Capital paired with Zillow and tracks both my mortgage (through my mortgage lender) and the value of my home (through Zillow). This means I now get a more real idea of our total net worth since it has all of our assets (bank accounts, investment accounts, home value) and all of our liabilities (mortgage, credit cards). Even though I don’t always trust the Zillow valuation, I still love this feature. Personal Capital looks at the fees and expense ratios of each of your investments and then looks at how those fees will impact your portfolio long term. You can also adjust the inputs (annual growth, annual contributions, employer match, expense ratio, other fees) and see how those will impact your overall portfolio. (The above image is after I played with all sliders. Since I have my retirement date set for when I’m 45 in my Personal Capital account, it only show the impact of fees until that point.) This feature is awesome. 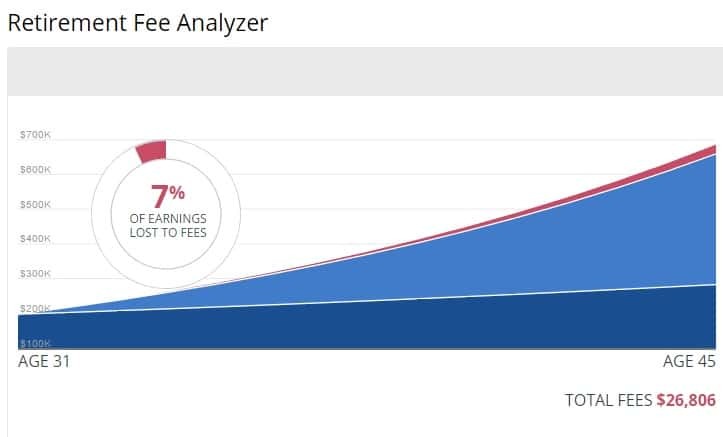 You can see actual projections with your own numbers on how bad those pesky fees can be. Should you sign up for Personal Capital? That choice is yours. Personal Capital is free because they depend on people to use their advisory services. And since you are a smart investor, you won’t be doing that. So, you’ll be signing up for the conveniences and the free tools, but you’ll have to deal with the hard sell. For me, the benefits outweigh the costs, but for you, it might not. The links to personal capital in this post are affiliate links. This means if you sign up through those links, Northern Expenditure earns money at no cost to you. If you are not okay with that, just search for “Personal Capital” in your search engine and sign up directly through them if you still want to sign up. Personally, I wouldn’t know what pops up when you log in, because Mrs. SSC has all of that account info and deals with that side of it. 🙂 That just reiterates the importance of having an “if I die” document on where our info for all that sutff is, just in case you know, someone dies. I know their fee anlayzer saved us close to $45k in fees between now and when we turn 60. We already had low fees to begin with, but using that tool, Mrs. SSC swapped some funds we were invested in for nearly identical lower fee options and bam! $45k not spent on fees goes back into our pockets. That’s almost a whole year of spending based on projected FIRE lifestyle spending. Why not use Mint that doesn’t have any pop-ups or other stuff, but still provides the same features? We love it! Hmmm. I always thought Mint was more for budget tracking and I love my Excel sheet for that… but maybe I’ll have to give it a shot!